Did Queen V really just win this Revenge War? That's certainly what the end of Revenge Season 4 Episode 21 looked like. She set a plan in place that Emanda never, ever saw coming and did it so masterfully that even I can't tell if Victoria is really dead or alive on an island somewhere sipping the pina coladas that Nolan won't get to share with Tony. Before we dive into whether or not Victoria Grayson is dead or alive, can we just have a moment of silence for Nolan Ross' love life? This guy is the most unlucky in love man ever to exist on a night time soap. He might get lucky a lot but that love runs out QUICK. From the moment Nolan came sauntering down the hall, carried forth by the smell of a home-cooked breakfast, completely relaxed and happy, I found myself thinking "Oh no. This cannot be good. Nolan's heart is about to get broken. DON'T FALL FOR HIM, NOLAN!" But Nolan did fall. And Tony did break his heart. At least Tony's reason was a good one and not, 1) that he's a psychopath, 2) that he was murdered, 3) that he's the long-lost son of Victoria Grayson and sleeping with him actually helps advance Emanda's plan to ruin the mother who gave him up for adoption, or 4) that he only wants to be with Nolan to get rid of his crazy family. Nope. Tony wants to be a dad and he wants to devote all of his attention to his new baby boy. Total class act, Tony. I don't think we've seen the last of you, but so far, A+. Now on to Victoria Grayson's brilliant scheme to ruin Emanda's life. Real talk: Is Victoria Grayson ACTUALLY DEAD? Or did she pull a tooth or two and leave it behind with a body she got from the morgue and Pascal's ring before magically getting far enough out of the blast radius of the house so that she remained completely uninjured? Is she sitting on a beach somewhere drinking mai tais and watching the coverage as Emanda is arrested for her murder? If so, damn, Vicki! This woman just pulled off the framing of the century with Mason Treadwell as her wingman. After thinking all this out, I'm going with there's no way Victoria Grayson is actually dead. She's definitely in hiding somewhere. She's too smart and too vengeful and too incapable of giving up to have actually blown herself up. She wants the world to think she's blown herself up so that she can make the world think Emanda killed her so that she can exact her revenge for that interview Emanda gave which should have destroyed Victoria for good. Geez. Amanda should've learned everything she knew about revenging from Victoria instead of Takeda. If Victoria Grayson is actually dead, I will eat my hat. How Emanda will get out of this one should be interesting to see play out. Ben using his broken heart, or whatever, to go after Emanda is totally dumb. He knows she capable of something like this, but he also knows that the people she's burned are capable of this, too. If he turns into a dog with a bone to pin all of this on Emily and put her away for good instead of being reasonable and using what he knows to do good police work, I'm going to get grumpy. Somehow, Jack and Nolan will find Mason Treadwell and he'll be forced to admit to working with Victoria. Oh, and brace yourselves, Jemily shippers. It looks like the conversation you've been waiting for is going to happen before the end of Revenge Season 4. After learning that Emily had gone to the airport to stop him from getting on the plane, Jack gave a little smile, and later visited the beach house to have that talk she said she wanted. He was too late, of course, and she was being arrested for Victoria's murder, but hey, he was there. Looks like he won't be moving to L.A. after all. Wonder if Nolan will give him his old job back? What did you think of "Aftermath"? Is Victoria Grayson really dead? 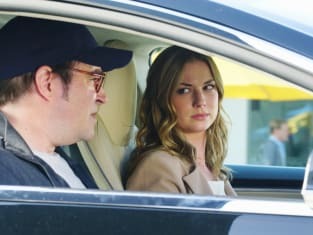 Revenge Season 4 Episode 22 airs next Sunday night at 10. Tune in and remember you can watch Revenge online!